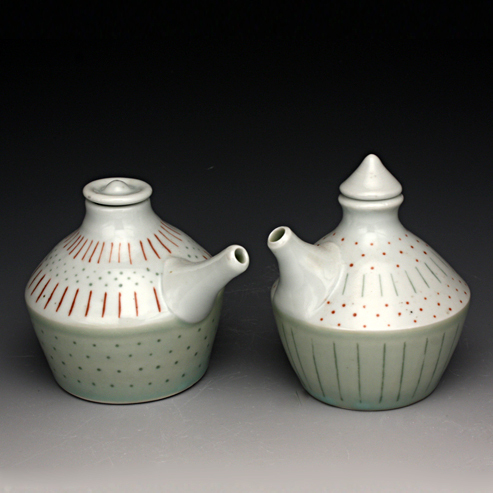 Red Lodge Clay Center is happy to welcome Nan Coffin to the gallery this year. If you aren’t familiar with her work yet, we are glad to make the acquaintance. “Nan Coffin’s clay career began in central Indiana in the mid-1970s. She is a self-taught potter, although many influences have come from other potters, books, trade journals, and the many clay workshops and conferences she has attended. Nan moved to southern Indiana in the mid â€˜80s and started Log Creek Pottery and studio gallery. At Log Creek Pottery she made a variety of functional wares, from majolica to stoneware and porcelain woodfired pottery. In 2001, Nan relocated to San Diego where she continues as a studio potter, sharing clay and kilns with her potter husband, Richard Burkett. Nan also worked with the Studio Potter Network, helping to coordinate efforts of studio potters, guilds and organizations. More recently she has been the Vice President of the San Diego Potters’ Guild.